Purple Myrtle Squeegy: Are You Scared Yet? Goddess, I am SO BORED! I can't wait to get home and continue working on the new issue of my zine... Oh, I didn't tell you? Yes! I am writing a new issue of PMS. It will be a split zine with my Salem penpal Nyxia who suggested we should do it, and I thought it was such a great idea. 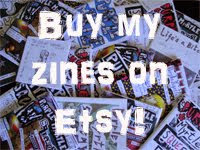 I was so happy that when I stopped looking for a zinester to make another split-zine with, a zinester found me. I will not say what this split-zine is about just yet, but I will say this: There will be a lot of slimy, spooky, creepy, dark and undead things in this issue. So Constant Readers beware! PMS issue 9 is coming your way. With pink skull zombie kisses!